The new Alfa Romeo Stelvio Diesel SUV mixes a fantastic driving experience with sharp looks. Easily one of the best cars at this price point, it’s also frugal but it does lack the option of a manual transmission. There’s a lot of choice out there in the medium-sized SUV market but the Stelvio has done a lot of the right things to deserve a place on your short list. It’s essentially like the Giulia saloon but bigger and sportier. Standard kit is also generous. OSV takes a closer look at what it’s all about with our 2018 Alfa Romeo Stelvio Diesel SUV review. In terms of the way it drives, the Stelvio is easily one of the most assured in this class. Whether you’re mending your way through winding country roads or negotiating tighter inner city turns, it always feels capable. It helps that the car shares a lot of its mechanical bits with the Giulia Saloon, and as a result it drives a lot like it. Responsive controls enhance the driving experience, while the electrically assisted steering is light but direct and precise. Unusually for such a large car, body lean isn’t an issue at all, even if you approach bends at speed. Ultra firm suspension isn’t the reason as the Stelvio’s setup is more on the softer side, yet its ride feels comfortable and smooth. However, it’s not as quiet as some rivals. As mentioned, there isn’t the option of a manual transmission. Instead, buyers have to settle for an 8-speed automatic ‘box which is responsive and smooth. It comes with a manual mode that puts you in control, but the automatic mode does a great job. The Stelvio also comes with the brands DNA drive mode system which lets you alter the car’s responses so that they better suit your driving style. In Dynamic mode, the steering becomes heavier, while the Natural Mode eases things off. Meanwhile, you can save on running costs in the Advanced Efficiency mode. In terms of its engines, there’s only one diesel available. It’s a 2.2-litre engine that develops 207bhp and is our top pick of the whole range. It can get you from rest to 62mph in 6.6 seconds, has plenty of pulling power available at any speed, and although it might not have as much power as the petrol you don’t need to work it quite as hard to unleash its potential. It does, however, emit a distinct rumble that gives it a sportier personality. Some buyers will like it, others won’t. Overall, the engine can be entertaining or relaxing – it’s up to you. Inside, the Alfa Romeo more than keeps with the Jones’ when it comes to interior quality. This is a first-class cabin that makes up for the rather second-rate interiors Alfa Romeo buyers have had to put up with in recent years, and then some. Real wood and aluminium are among the high-quality finishes and build quality are good. In fact, when it comes to the way it’s styled, there are even nods to its Italian cousin, Maserati. On the other hand, it still can’t compete with the German exec’s, such as the latest Audi Q5. Driver’s will be pleased by its usability. Visibility is excellent thanks to the elevated driving position and you’ll feel as though you’re seated in a Porsche Macan. Its dashboard is also pleasing. It looks a lot like the one in the Giulia Saloon and this is no bad thing, as it means you get a large central infotainment screen that flanks a pair of main instruments. OSV likes how the instruments evoke Alfa Romeo’s from days gone by too, and they’re also super easy to use. Each model comes with a neat colour information display that lets you know where you’re at for range and fuel consumption, but there’s little chance of the Stelvio getting an all-electric instrument cluster of the like seen in the German exec’s. In terms of how practical it is, the Stelvio isn’t quite as spacious inside as some of its closest rivals and it isn’t as practical. Four adults should be able to traverse long trips in comfort, but any adults over six foot will feel a bit cramped in the rear. Figures for the boot are yet to be released, but it looks like it will be usable and competitive. Standard kit is generous across the range with the entry-level model getting eight speakers, Bluetooth, a digital radio, an 8.8” display, the brands UConnect infotainment system, dual-zone climate control and 17” alloys. The Super trim adds a two-tone leather dashboard, part-leather seats, a 7” screen with sat-nav, front parking sensors and 18” alloys. The Speciale trim chucks in gear change paddles, aluminium interior trim, heated leather seats, power-folding door mirrors and 19” alloys. Is the Alfa Romeo Stelvio Diesel SUV safe? It was awarded all five stars when crash-tested by Euro NCAP, while its standard safety kit includes active cruise control, forward collision warning and blind spot warning. Prices for the new car start out from £33,990 and rise to £45,390. For more information on our leasing deals, check out our page here. In terms of its running costs, the 2.2-litre diesel is the only engine and it’s affordable to run. It can return as much as 58.8mpg and emits a respectable 127g/km of CO2. Road tax is pegged at £140 per year but insurance group ratings haven’t been released yet. Servicing packages will be available from your local dealer, and the Stelvio will need a yearly service. Did anyone seriously doubt that Alfa Romeo wouldn’t produce their midas touch for an SUV? It might be a bit bigger than a typical Alfa Romeo but it still looks desirable. The Stelvio is genuinely one of the best cars of this type to drive and feels really involved. It’s like the Giulia but larger. A big car doesn’t need to come with big bills, with the diesel able to return over the 58mpg economy. The quality is poorer than expected. Where usability is concerned, there are more accomplished rivals. 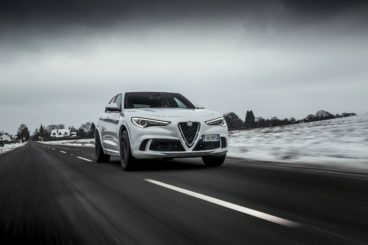 Let’s see how the car fares against its rivals in the comparison section of our 2018 Alfa Romeo Stelvio Diesel SUV review. The new Skoda Karoq Diesel is fun, well-equipped and more practical than the Alfa Romeo. An Alfa Romeo or a Skoda? A few years back, there would have been no arguments, but Skoda as a brand has come on leaps and bounds over the last decade. On the road, the Karoq is a genuine contender to the Stelvio, its smooth suspension playing a key role as it eliminates nasty lumps and bumps. The way the Skoda drives is a delight, too. 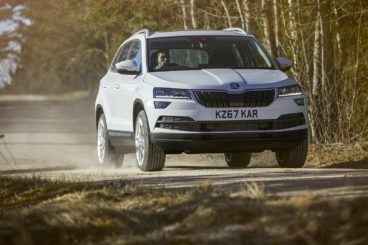 It’s essentially a lighter and smaller version of the hefty Skoda Kodiaq, and with sharper steering and minimal body lean it’s easy to take on twisting mountainous roads. In terms of its diesel engines, there’s a little more choice here than there is with the Alfa Romeo. The veteran 1.6-litre TDI has been around for a while and it never lets you down. It develops 113bhp and covers the 0-62 dash in 10.4 seconds. That should be enough pace for most buyers, but it can get a tad noisy. A quieter, more powerful and faster 2.0-litre TDI 148bhp diesel is your alternative. It ascends hills with ease, overtakes with ease but it is four-wheel-drive only, which can have a dampening effect on drivability and economy. Not too much, mind. The smaller diesel is front-wheel-drive only and it averages 61.4mpg economy, but that bumps up to 64.2mpg if you add the DSG automatic transmission. The bigger diesel is in the fifties, which is still respectable for a car of this size. Inside, the Skoda Karoq is bang up to date. Its cabin is sturdy, nice to look at and stocked with plenty of advanced tech. It also has an upmarket feel that allows it to compete with the Alfa Romeo. Moreover, its comfort and refinement levels are high, which make it a very pleasant place to be. Is the Skoda Karoq Diesel practical? It sure is. 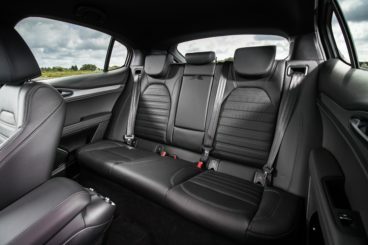 With plenty of room for its back seat passengers, the Skoda can claim to be more family-friendly than the Alfa Romeo. There’s bags of interior space, while the tall roofline means headroom is good for all. The steering wheel and driver’s seat offer plenty of adjustability, while the boot comes in at 521-litres. Fold the rear seats and you can extend that to 1,810-litres. 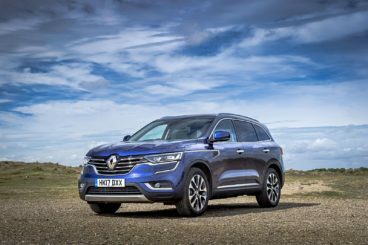 The new Renault Koleos Diesel is an assured-looking large family car that’s comfortable, affordable to run and well-equipped. Unlike the Alfa Romeo, the Renault is all-diesel. Both the 1.6 and 2.0-litre engines are strong performers that have been taken from the Nissan X-Trail. The former is front-wheel-drive, while the former is four-wheel-drive. The 2.0-litre variant is expected to be the biggest seller, thanks largely to its size. It’s the kind of big engine you need for a car like this. It develops 175bhp, which allows it to cruise on the motorway at a good pace. It comes with a manual gearbox as standard, but a CVT automatic ‘box can be specified instead. We like it and it’s one of the best of its type, allowing smooth progress and unflustered acceleration. Moreover, it gets the car from rest to 62mph in 9.5 seconds. Compare this to the manual transmission, which takes 10.7 seconds to complete the 0-62 dash. The 1.6-litre diesel shouldn’t be totally discounted. It develops 129bhp, can do 0-62 in 11.4 seconds and its manual gearbox is smooth enough. In terms of running costs, the 1.6-litre diesel is the most frugal, returning 57.6mpg at best. It also emits just 128g/km of CO2, which puts it in the 27% band. The bigger diesel engine, meanwhile, returns 50.4mpg economy if you stick to the manual transmission and 47.9mpg if you opt for the automatic ‘box. Inside, the Koleos genuinely sports one of Renault’s finest ever cabins. The design is simple but works so well, and we like the introduction of a portrait touchscreen display. Soft-touch materials are used here and there, while the seats are super comfortable and allow for a lot of room. Is the Renault Koleos Diesel practical? It’s among the class-leaders for knee room, while headroom is also good, both upfront and in the rear. A panoramic sunroof comes as standard on all models which allows for excellent visibility for all, and there are lots of storage areas to help you keep the place clean and tidy. The powered boot, meanwhile, measures 565-litres. It’s possible to open it just by waving your foot under the bumper, and when you fold the rear seats you can extend its capacity to 1,795-litres. This is the Italian brands first ever SUV. Don’t let that scare you off, as it’s anticipated to be their best seller. While we wouldn’t usually associate large cars like this with Alfa Romeo, the new Alfa Romeo Stelvio Diesel SUV has style, charisma, space and frugality. The perfect package? Not quite. But if it’s a desirable SUV you’re after, this should be at the top of your list.